wrapping grass coils with fine sisal fibers. 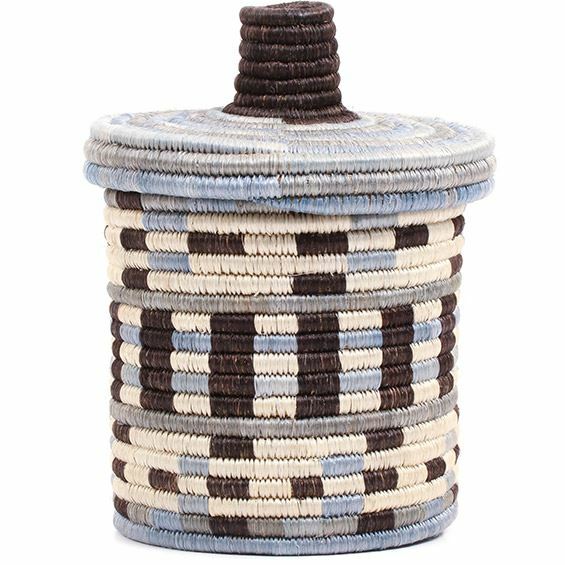 Handwoven from smooth sisal fibers wrapped around native grasses and reeds, these colorful canisters are and beautiful and useful. Like to the bowls in our Rwanda Baskets Collection, these colorful baskets are created by wrapping soft, fine strands of sisal fiber around coils made from native grasses. 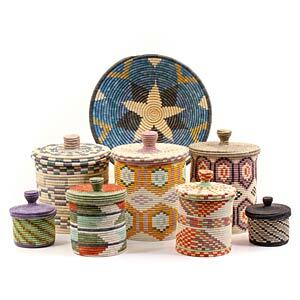 These handmade pieces feature bold colors and geometric patterns. The lid fits snugly, keeping the contents securely in place. These baskets come from a weaving group that teaches and promotes artisan skills to help create opportunities for weavers and their families.